Of course there is more to marketing than direct buys. Possibly people see the ad, it increases a subliminal awareness of the brand. And then they search for and buy the game later. If they can find it in the app store. A quick tangent that I’ll talk about more in a later post: Some game companies are buying installs – for free games. They’re purposely spending up to several dollars per install. I’m not sure how this works out yet or how they make money this way. Maybe they’re making more than a few dollars on ad revenue. Maybe they’re just trying to drive up users so they can sell their company. This isn’t me. Call me crazy but I was trying to make a profit by getting installs for less than what I make per install. Another factor is whether or not my creative is effective in drawing people in to click the ad. Possibly the creative isn’t doing it’s job. Still, in order for the ad to break even, with a app buy revenue of $1.4, we’d need 200 buys to cover the $275 cost. That would be a click through rate of .2%, which is probably double what anyone is getting with these ads. And if the game was $1 instead of $2 you’d have to double that. Is anyone getting a CTR of .4%? Doubt it. I just don’t see how ads work for the little guy. Maybe big banner ads and site wrap type ads work for those who are shelling out the duckets to pay for that. Maybe there is some trick to it that I’m missing. But so far, ads have never worked for me. I’m going to swap out the creative for the remaining 15k and see if changing it to something more teasey and less specific works. I’ll post the results. One interesting note. The current creative doesn’t have a price on it. Somewhere in this chart the ad said “FREE this weekend”. I did a weekend you could get the full version of the game for free. The rest of the chart the ad was a regular ad for the paid version that just has the name of the game and some graphics. By looking at the chart can you tell when the game was free? I swapped out the creative for a “company ad” and let my last 10k impressions run out showing that. 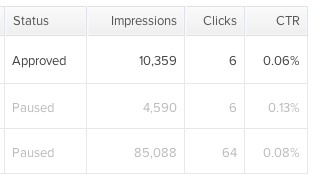 When I looked at the numbers more closely I could see the differences between the 3 in terms of click-throughs. Here’s the data. I know it’s not quite fair to show the data without showing the actual ads, because one of the creatives could be crap and be causing the difference in CTR instead of the copy. But for now at least I’m going to keep this blog generic. The first ad I ran is shown in the middle. It only ran for about 2 1/2 days (shown on the line graph above also) and had 4,590 impressions. It said “FREE! This Weekend. No Ads! Full paid Version! Grab it right now!” The CTR actually was actually higher at .13%. The rest of the time my game wasn’t free. So I replaced it with a generic statement about the game having a new version.. “The Ultimate __ Game Just Got Better!”. This is the ad that ran for about a month with .08% CTR and prompted this blog post rant. Then the last couple of days I did the company ad which only had a logo. It’s the top one in the chart above and had a lower CTR at .06%. To be fair, one major difference between the 3 ad is the call to action. That first ad did say “get it right now” and explained that the deal was only for the weekend to add urgency. It did have the strongest call and the last ad had the weakest. So this could be the root cause. When I bought the ad I thought that all 100,000 impressions would happen that first weekend. Instead it took about a month for them to get used up. I have mixed feelings about this. The buysellads.com control panel does have a way of a/b testing ads where you can upload 2 creatives and see which one is doing better. Then drop the one that’s not doing as good. The ads can be animated gif’s which provides more ‘room’ for ad copy. I didn’t have time to do this. Clearly more could have been done with my ad to make it more effective. Had the ad brought in .13% all month it still wouldn’t have broken even. Although it would have been closer. My overall take is still that there’s probably no way to get a high enough CTR to make the ad profitable, where you make more in sales than what the ad costs. But also.. the .13% was when the game was free and therefore had NO revenue for installs that weekend. I made it free in an attempt to raise ranking, which is a different topic all together.